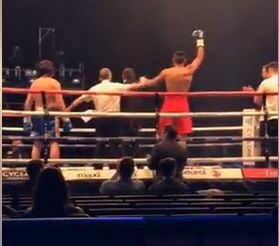 Malik Zinad (red shorts) wins his 11th consecutive fight (Photo: social media). Maltese-based and Libyan-born boxer Malik ‘‘The Trigger” Zinad won his twelfth straight fight yesterday against Latvian Jevgenijs Andrejevs. He knocked out the Latvian in the second round. The fight took place at the SEE Hydro in Glasgow, Scotland. The professionally undefeated Zinad had won his tenth straight fight against Bulgarian Tsvetozar Ilieve in Malta in December. The 24-year Zinad is the reigning WBF International Light Heavyweight Champion. Zinad was forced to leave Libya as an 18-year old in 2013 to escape the troubles there after the 2011 revolution in order to further his career and dreams. ”I came to Malta 3 years ago for my boxing in order to be the best fighter”, he had told Libya Herald in September 2017.